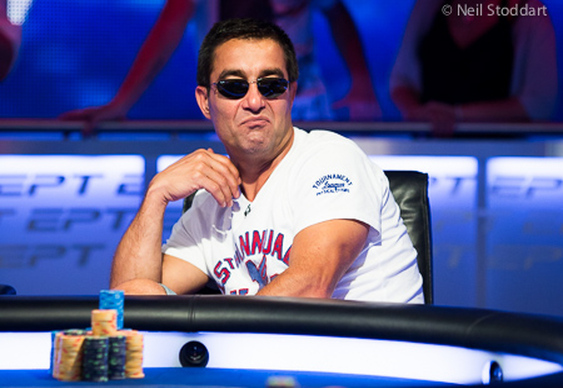 The PokerStars EPT Barcelona final table has been set with Hossein Ensan leading the charge for the €1,261,000 first prize. The 50-year-old has already enjoyed himself in the Catalan capital, winning the first ever EPT seniors event and then a live satellite to secure his seat in the Main Event. He'll return with 10,295,000. The final eight may lack star power but there will be plenty of talent on show in the form of recent WPT Venice winner Andrea Dato, 2013 PCA finalist Andrey Shatilov and American grinder Samuel 'buckguy2000' Phillips. Rounding out the field are amateur Ji Zhang, online MTT pro Kiryl Radzivonau, PokerStars Supernova Slaven Popov and German grinder and coach Andre Lettau. The record-breaking EPT Barcelona €10k High Roller field of 393 runners has been whittled down to just 21 with Aussie Millions winner Ami Barer out in front. As expected, there's plenty of class on show with the final three tables featuring the likes of Juha Helppi, Angel Guillen, Benjamin Pollak and Marc-Andre Ladouceur. Stephen Chidwick is flying the flag for Blighty and is well placed for a very deep run. The final 21 are guaranteed a score of €34,300 with the eventual winner set to walk away with €747,200.